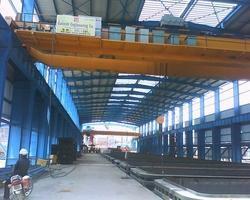 Manufacturer of a wide range of products which include heavy duty eot crane, double beam eot crane, single girder eot crane, industrial eot crane, single beam crane and eot crane. 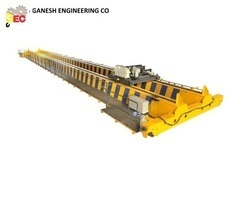 Ganesh Engineering Co. make Double Girder EOT (Electric Overhead Traveling) Crane is Specially designed structures with mechanical means for Traveling in both directions and raising and lowering a load by electrical, and its consists of Structures, Wheels, Gearboxes, Wire Rope, Electrical Motors and Panels, Hook assembly etc. We recommend you the perfect customized solutions after doing an in-depth analysis of your applications, production facility, factory, and material handling requirements. 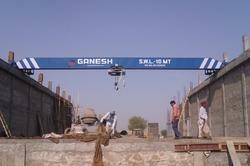 Ganesh Engineering Co. make Double BEan EOT (Electric Overhead Traveling) Crane is Specially designed structures with mechanical means for Traveling in both directions and raising and lowering a load by electrical, and its consists of Structures, Wheels, Gearboxes, Wire Rope, Electrical Motors and Panels, Hook assembly etc. We recommend you the perfect customized solutions after doing an in-depth analysis of your applications, production facility, factory, and material handling requirements. We offer a comprehensive range of Industrial EOT Cranes which includes single girder cranes, monobox cranes, Jib cranes, double girder cranes, goliath cranes & H.O.T. cranes. These are designed in accordance with IS 3177 which ensures that our products are safe with respect to appropriate duty classifications. 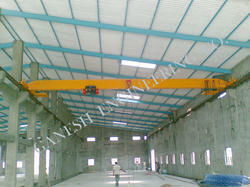 The structural parts of the cranes are designed in accordance with IS 807 and are known for their robust construction and dimensional accuracy. Available in Class-I, Class-II,Class-III, and Class-IV, Duty. Load Capacity(Tons) 5t. - 100 t.